Below are the answers to the common questions Duratherm get asked by people interested in their SIP building system. 1. Why is this a “green” product? When asking the question what qualifies a material as “green,” the particular properties of the product are weighed in both the short-term and long-term balances. The question of short term effects are based on the immediate environmental effects required to produce the product. Both the production method and the renewable resources that are used to make the product are evaluated. For example, Rosewood for guitars is not easily renewable. Cement and cellulose for the cempanel are very abundant. Smoke from coal burning power plants that create electricity is harmful; however, production of the panels creates no direct greenhouse gases. Therefore, in the short-term, panels do indeed qualify as a “green” product. In the long-term, the final products of homes and buildings made with the panels contribute to a smaller long-term carbon footprint in that it is far more energy efficient to heat and cool. These are just some of the reasons that SIPs have been approved by the UN for green self-sustainable building projects. 2. What are some of the advantages of building with SIPs? 3. How do SIPs perform in an earthquake? The Mexico City earthquake in 1985 recorded G-forces greater than 4 and has been used to develop computer models for risk analysis of differing construction methods. SIPS have been tested to withstand a G-force greater than 7 without effecting the structural integrity. By many experts, SIPS are considered the most effective safe house for the money. Read our Simple Explanation of Earthquakes to understand why SIPs are your best choice for building a safe home to withstand earthquakes. 4. What R value do the SIP (Structural Insulated Panels) with cement sheet skins have? Vacuum insulated panels have the highest R-value polystyrene insulation at roughly R–6 and R–5 per inch. 5. Prices for building construction with SIPs? Compared to timber house construction there can be a price saving from 10% to 40% depending on the complexity of the design. 6. 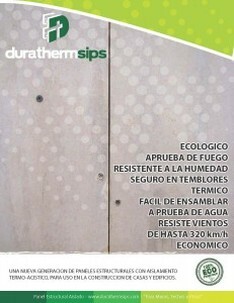 How strong are the SIP wall, SIP roof and SIP floor panels from Duratherm? 10cm thick panels are used for the wall SIP while 15cm thinkness is recommended for roof or floors. 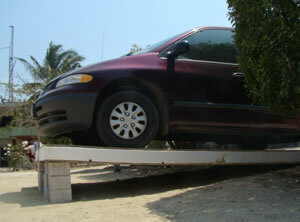 As you can see from the following image, the SIP panels are easily strong enough to support the weight of a car. 7. How should I design with SIP panels? Read some SIP design guidelines on the page, "How should I design with SIP panels?" To know more but we suggest downloading and using the free application Google SketchUp and SIP models that have been uploaded.